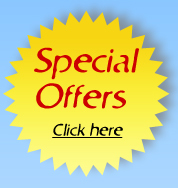 INCREASE SALES BY PUTTING TOGETHER A SPECIAL PROMOTION USING PREMIUM INCENTIVES! CUSTOMER BUYS FROM YOU BECAUSE OF THE FREE GIFT! 1. Select the incentive you would like to use from our available list. 2. Once you receive the certificates you simply implement them into your current advertising campaigns to grab your prospective customers' attention and gain an edge on your competitors. 3. Distribute them to your customers when they come into your store, or send them to the customer by mail if you are using a call center or internet sales. 4. Your customer then follows the simple instructions on the back of each certificate and sends it to the address listed for redemption. 5. We send the gift to your customer and handle any customer service via our toll free number or email. 6. It's that simple! Place an order today and you'll have your certificates in no time! We can also put together custom incentives just for you. You can set your own terms, and S & H and brand it with your logo. If you would like information about this service give us a call for a free quote!